The Hibernate Many-To-Many Bidirectional Mapping Example tutorial shows you how to use Hibernate Many-To-Many Bidirectional mapping using annotation based configuration. In Many-To-Many relationship, an intermediate table is added and it is known as Joined table. Its primary key is the combination of primary key of both the associated tables. We are taking an example of Student and ClassRoom relationship. This relationship said that a student can register multiple ClassRoom and one ClassRoom has many students. Here we have first created the main tables STUDENT & CLASS_ROOM. then we have created a joined table STUDENT_CLASS_ROOM whose primary key is the combination of primary keys of STUDENT & CLASS_ROOM. return "Student [id=" + id + ", name=" + name + ", enteringDate=" + enteringDate.toString() + ", nationality="
We are considering the bidirectional relationship so that we have to add the above code on ClassRoom class to make the relationship between Student and ClassRoom is bidirectional. The mappedBy attribute indicates that it’s the inverse side of relationship. This relationship is managed by “classRooms” property of Student annotated with @JoinColumn. @ManyToMany says that there is a Many-to-Many relationship between Student and ClassRoom. A Student can enjoy multiple ClassRooms, and a ClassRoom can have multiple Students enjoyed. The attribute cascade = CascadeType.ALL indicates that while persisting (update or delete) Students, ClassRooms will also be persisted (updated or deleted). @JoinTable indicates that there is a intermediate table which joins two tables: STUDENT and CLASS_ROOM. This table has a primary key that combines by two primary keys of Student and CLASS_ROOM table. This annotation is mainly used on the owning side of the relationship. The attribute joinColumns refers to the column name of owning side(ID of STUDENT table), and inverseJoinColumns refers to the column of inverse side of relationship(CLASS_ROOM_ID of CLASS_ROOM table). Note: Don’t forget override hashcode and equals method which are looked by hibernate when holding entities into collections. We will create main class to demonstrate this Hibernate Many-To-Many Bidirectional Mapping Example. In the above code, we have initialized the classRooms property of Student class, and just persisted Student objects. Here, ClassRoom objects will be persisted automatically, this operation is thanks to the Cascade attribute. 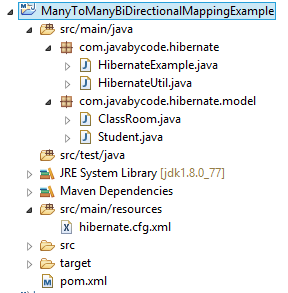 That’s all on the Hibernate Many-To-Many Bidirectional Mapping Example tutorial.